Claudia Olds Goldie has had numerous solo exhibitions in the U.S. and has shown in international shows such as the NCECA Biennial in Houston and SOFA Chicago (Sculpture Objects Functional Art and Design). Her work has been showcased in several State of Clay national juried exhibitions, at the Fuller Art Museum, in Ohio Craft Museum’s Figure It Invitational, and in Contemporary Figurative Sculpture at Santa Fe Clay Gallery. Olds Goldie is a 2017 Mass Cultural Council finalist. She received a nomination for a Boston Foundation Brother Thomas Fellowship, a Kiln God residency from Watershed Center for Ceramic Arts, a fellowship from the Vermont Studio Center, and an Artist Award and from Boston Society of Arts and Crafts. She teaches figurative ceramic sculpture at Harvard University’s ceramic program as well as workshops around the U.S. and in Mexico. 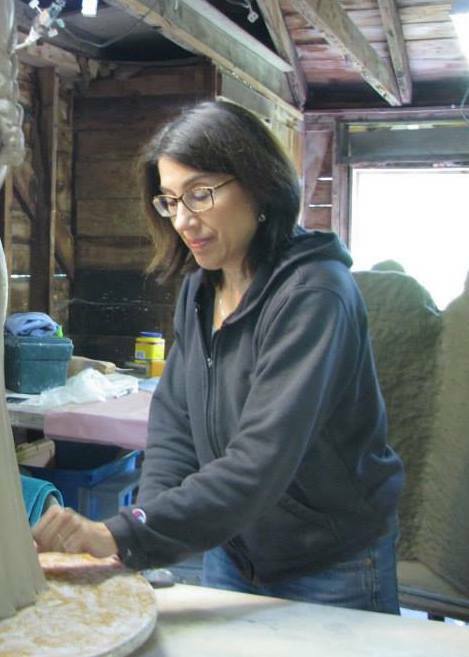 Her work has been published in 500 Figures in Clay, 500 Figures in Clay Vol.2 by Nan Smith, Sculpting Clay, and Low Fire: Other Ways to Work in Clay, both by Leon Nigrosh, and Ceramics Monthly, Clay Times, and American Craft magazines. Click here for Claudia’s C.V.